Iron hilt, consisting of hammer-headed pommel, with square brass plate over prominent tang button, cusped quillon block and flattened, horizontally recurved quillons, widening towards both ends. Rectangular-sectioned tang, widening slightly towards the blade. Straight, single-edged blade, tapering to spear point, with flattened faces. [A.] 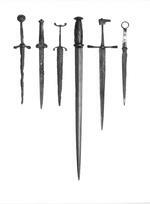 L. Thompson, Daggers and Bayonets. A History, Spellmount, Staplehurst, 1999, p. 29 (illus.) - 'probably English, mid-late 15th cent.'. 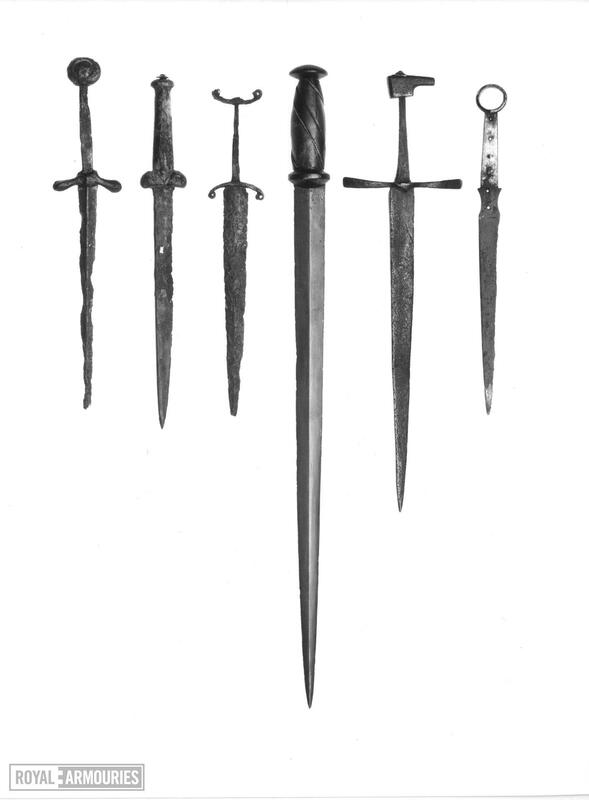 Similar examples include X.690; X.1706, dagger with similar hilt found in the Thames beneath Southwark Bridge and acquired by the Armouries in 1997; a dagger with beaked pommel, said to be from the Thames and illustrated in MS catalogue of Collection of J Bernhard-Smith; ; another from the Thames at Mortlake in the Museum of London (A 14620); dagger with similar quillons and an asymmetrical pommel with comb, excavated in worship street, also at Museum of London (A 6617).